Trust Reliance to not think small. Reliance has just acquired two of India’s top cable networks as it looks to kickstart its ambitious JioGigaFiber business. Reliance will pick up a 51 percent stake in Hathway, while it will acquire a 66 percent stake in Den Networks. 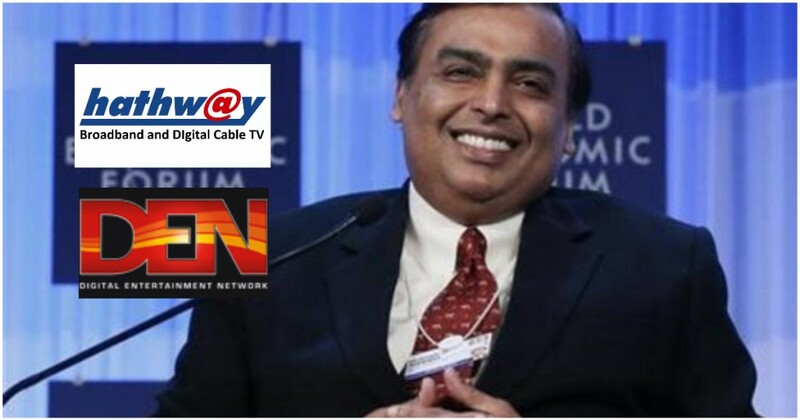 Reliance will look to utilize the last-mile connectivity infrastructure of both these established cable network players to provide the last-mile connectivity for its own high speed fiber internet service. Reliance had first announced JioGigaFiber in July this year. Apart from providing internet speeds that would be as high as 1 Gbps, Reliance had said that Jio will bundle several services along with it. Reliance is expected to carry TV services over the high-speed fiber cables, which will pit it against traditional DTH operators like Dish TV and Tata Sky. Reliance had thrown in some futuristic gizmos as well — it said that the high-speed internet would also connect with home security systems, video conferencing equipment, and even home safety sensors. It had sounded like an ambitious project, and Reliance had said it would begin enrolling users from the 15th of August. But it had emerged that Reliance was having trouble with laying the last-mile connectivity for its fiber cables. Reliance would need for its cables to reach every home where it wishes to provide internet, and apart from the logistical issues, it was reported that entrenched cable monopolies were preventing it from laying its cable in certain areas. Reliance has solved this problem like only it could — it’s simply ended up acquiring two of India’s largest cable operators. Hathway has 11 million cable subscribers, while its broadband internet connections reach 800,000 homes. Den Networks, on the other hand, is present across 13 million homes. Reliance will likely use this existing infrastructure and users to bring its JioGigaFiber connectivity to these homes. Hathway and Den Networks don’t have the same fiber optic cables as JioGigaFiber, but could nevertheless help Reliance in quickly bringing its service to users across the country. JioGigaFiber could well turn out to be one of Reliance’s biggest bets. Just like Jio had steamrolled India’s telecom space, it’s expected that JioGigaFiber will do the same, but for two different industries — home broadband and TV. In addition, JioGigaFiber will throw in gizmos that Indian consumers aren’t currently familiar with. And if Jio’s pricing plans are any indication, all these services will be priced significantly lower than the competition. Reliance clearly has big plans for JioGigaFiber — and the acquisition of two of India’s largest cable networks could be just the start.